How important is it to take care of your pet’s oral health? By age three, 80% of dogs and 70% of cats have some evidence of periodontal disease, which can cause mouth pain, tooth loss and make eating difficult. At advanced stages, bacteria from the mouth can enter the bloodstream and cause heart, liver and kidney complications. This is why Dr. Cooper and Dr. Cauthen regularly check your pet’s teeth during an exam and may strongly recommend a dental cleaning or “scaling” procedure. At Animal Medical Center of Tyler, we have advanced diagnostics equipment including a new digital dental x-ray machine, which is ideal for helping catch periodontal disease, which hides under the gum line. 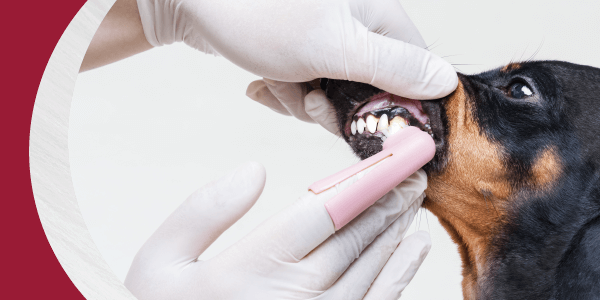 With this new technology, we can see under your pet’s gum line to better evaluate your pet’s dental health. That way, we can prevent oral disease before it becomes a bigger—and more expensive—problem. Since February is Pet Dental Month, what better way to celebrate than to get your pet’s mouth so fresh and so clean while also saving money? We are very pleased to present our 20/20 dental savings spectacular—during February, we will happily “brush away” 20% of your bill for digital dental x-rays AND throw in an additional 20% off your pet’s dental procedure, for a total of $72 in savings! Want to take your savings to the next level? In addition to our 20/20 dental deal in February, we’re also cutting the enrollment fee on our Platinum Preferred Pet Plan in HALF! This means you’ll get a screaming deal on our top-level pet services which INCLUDE a dental cleaning, complete annual vaccines, comprehensive blood testing and evaluation, unlimited annual office visits and more! Not-to-mention you’ll be able to space the cost of your pet’s care out in to 12 easy and manageable payments. Plus, we’ll even give you 20% off of digital dental x-rays too! It’s that time of the year to get your pet’s dental health in order and this deal is too good to pass up. Dental appointments fill quickly and this offer is only good through February 28th so contact us today at 903-617-6891 or schedule a visit online.